This blog isn’t a review/giveaway blog per se, but I am all about sharing creative ideas and tools to help you in your own creative insanity. And I’ve had a lot of friends approach me for help in getting started with digital scrapbooking and/or blogging. AND I know we bloggers love us some FREE stuff. So when Bonnie at Tutor Me, Girl contacted me about doing a review and giveaway, I thought this might be a great idea. What is Tutor Me, Girl? Tutor Me, Girl! is an online tutoring club. Members of the club can watch video tutorials on all aspects of digital scrapbooking using the Memory Mixer Software. There are also lot of tutorials about blogging and other computer related issue, like security settings. Club Members also receive Freebies and tutorials by email on a regular basis. The Digital Scrapbooking Starter Kit includes a membership to the club and the Memory Mixer software. I always have a hard time knowing what to say when someone asks me how to get started in digital scrapbooking. Because the first issue is always about software. You have to have some kind of software that will work with layers and allow you to add and edit several elements on one file. The software you most often hear about is Adobe Photoshop. The full version of Photoshop is extremely comprehensive (and extremely expensive) so many scrappers opt for the Photoshop Elements route, I currently use Corel’s Paint Shop Pro software, which seems to have most of the same features as Elements, costs a little less, and is a little more user-friendly. That being said, there is a BIG learning curve on these programs, and someone who isn’t very computer savvy might get really frustrated trying to figure them out. Heck, someone who is somewhat computer savvy might get frustrated. I once spent 20 minutes trying to figure out how to move around a photo in PS Elements for a friend—even though I was already very familiar with my PSP. That is where I think Memory Mixer, fills a great void. It doesn’t have all of the features of those other programs, but is much easier to use, and has everything you need to put together cute scrapbook layouts. It is designed specifically for scrapbooking, so I wouldn’t get it if you want to do a lot of other kinds of digital design, but if you are new to digi-scrap, want to make digital layouts and get them done, this might be perfect for you. I keep thinking about my MIL who has just signed-up for a Photoshop class at the community college, so she can start digi-scrapping. If I had done this review before Christmas, I definitely would have signed her up for Tutor Me, Girl and purchased the Memory Mixer software instead. Beginners will be able to see nice looking finished products right away. Uses all of your fonts, and can access other backgrounds and elements you may have on your computer. Includes drop shadow tool–which I think is essential, so pages have dimension! Lots of pages and elements included. I was excited to see kits by Michelle Coleman included with the software! She is probably my favorite digital designer of all. Quick pages are quick, but also flexible (can be edited). Great starting place! No layer navigation tool–This is only an issue if you use a lot of elements on your pages, but I use a lot of elements. May not be able to use papers and elements that come with the software with other software, like Photoshop, if you decide to go that route later on. Not every element is super realistic looking to me, but technology improves all of the time, and is compatible with elements papers you can download from the internet. Bottom-line: If you are a beginner, or someone who wants to make and finish digital scrapbook albums in a short period of time, this is a great product for you! If you are planning to do more serious photo editing, or digital design that requires more flexibility (and you are comfortable on the computer) I would look at Corel Paint Shop Pro, and/or Adobe Photoshop Elements. The tutorials on Tutor Me, Girl are very thorough and easy to follow. The nice thing is that they are all videos, which is great if you are visual like I am. Also, it is easy to pause the video to follow their directions and then come back to it, so you don’t have to try and remember a lot of steps at one time. Great for beginners–they don’t assume you already know how to do a lot of stuff. The membership in the club is free for the first month with the purchase of the software. Computer savvy scrappers, may not need more than 1 month of tutoring to feel comfortable with the software, but may elect to continue in the club to receive the freebies, tutorials, and project ideas, which come several times/week. There are tutorials about blogging, gmail, computers security features, and lots more, besides the scrapbooking tutorials. So here is what you have all been waiting for. Tutor Me, Girl, is giving away a Digital Starter Kit (Memory Mixer Software + 1 month membership to their Scrapbook club–$39.95 on their website) absolutely free to one of my amazing (and lucky) readers. To enter, check out the Tutor Me, Girl page, and then come back here, and leave me a comment telling me about your experience with digital scrapbooking. Do you do it all the time? Tried it but needed some help? Never tried but wanted to? Or are you a paper and scissors girl? What kinds of questions do you have about getting started? If you follow my blog, tell me in a separate comment for a second giveaway entry. And if you decide to blog about this great giveaway, leave a third comment, and I’ll give you another entry. (Tutor Me girl is only able to ship with in the US for this giveaway, sorry.) Giveaway ends at midnight Friday (1/30) (or rather Saturday morning), and the winner will be announced at some point Saturday (1/31) after soccer and all that other stuff! Since there can only be one winner, Bonnie at TMG is generously offering $10 off the price of the starter kit just for My Insanity readers. Isn’t that nice? We’ve set up the Pay Pal link here. (Ordering at their webpage will cost full price). If you are big into giveaways, go here to find more giveaways than you could possibly enter (but you might have fun trying). Alright, talk to me! Good Luck, everyone! I checked the Tutor Me, Girl site. It’s cute and looks really simple. I’ve thought a lot about scrapping, never had the desire with cutting and pasting, but maybe now that its gone digital…. I just dred having to gather and organize all my pics, which are on several different hard drives and in bunches of different files–AAAAGGGHHH!!! I try to follow your blog–I just don’t get here but once or twice a month! Love ya! I’ve never don any digital scrapbooking, but would like to. The fact that it’s relatively quick would be a huge plus around here, as I just don’t have time to do it the old way anymore. I have never done digital scrapbooking… I have always wanted to check it out (I am a huge paper and scissors scrapbooker, but I’m more of a computer girl) I think I would get much more scrapbooking done this way, and enjoy the results! This looks very interesting. I’ve been scrapbooking the cut and stick way for a long time, but now that our photos are all digital, I’m not getting them printed, so perhaps this is a decent option. I know my daughter would like it. I have never really scrapbooked I started one but never finished it, I keep saying I’ll get back to it. I would love to do it but am a little scared. This sounds like I may be able to do it, the tutorial is great. I would love to try. I’ve played around with digital scrapping, but I really don’t know much. I checked out the website. It looks like it’d be a good program for me. I’d like to try photoshop but I don’t know how good I’d be at digital scrapping so I don’t want to spend the money right now. Paper scrapbooking frustrates me because I cut something out and I realize when I’m done what I would have liked better but the paper is already cut so Digital scrapbooking would be awesome since I could just fix it! I follow your blog. Maybe someday I’ll be able to pull off the insane amount of things you do but for now I love looking at them! I could use some help. 🙂 I can get a lil’ overwhelmed when ideas come rushin’ at me. lol Thanks. I have been wanting to try digital scrapbooking but have been too intimidated. In fact, I have Photoshop Elements but haven’t installed it yet because I know I don’t have the time to learn it. This site and software sounds perfect! This sounds awesome and the monthly price looks pretty good, too. I’ve done a little digi-scrapping and would love to do more, but I need help! Thanks for this giveaway! Oh this sounds fun and looks pretty easy. I would love to win so I could give it a try. I’ve never done digital scrapping but would love to start. So please add my name to your giveaway. I’ve been digi-scrapping with an open-souce photo-editing program for about a year now. The program (Gimp) has quite a steep learning curve, and while I love the versatility I have, it does take me forever to put something together (and get it just how I like it). It sounds like this program would give me the satisfaction of having a nice-looking layout, without it eating up so much of my time. For that reason, I’d love to give a try. I checked out Tutor Me, Girl out of curiousity for my sister. I am a Photoshop girl all the way simply because I’ve been using it so long. But my poor sister is having the hardest time learning the ropes of Photoshop. She calls me multiple times a week nearly in tears because she can’t get Photoshop to do what she thinks it should! I think that for her sake I need to enter the drawing for this simple, user-friendly program. Thanks for the review! What?! You have a digital insanity blog, too? Now I need to start following that one as well. I REALLY liked the book your made your FIL with all the journaling. Way to go, Kendra! I’ve never tried digital scrapping. I really love my scissors, rulers, Sizzix, and all those embellishments that I use. I’d love to try digital scrapping……not sure if I will like it or not. I use digital scrapbooking to make my blog templates, but that’s about it. Maybe new stuff would motivate me to do more. Check out my Scrapbooking Mommy blog. Even though I have a idea of how to do it I think the mbrship and software would be great to have! I would love to start digital scrapbooking. I think it's the only way I'd get anything done! I tried to do the paper & scissors route but was too overwhelmed. The closest thing to digital scrapbooking that I've done is those make-a-book things that they photo websites have. I enjoyed doing it though so I think I'd enjoy this too. 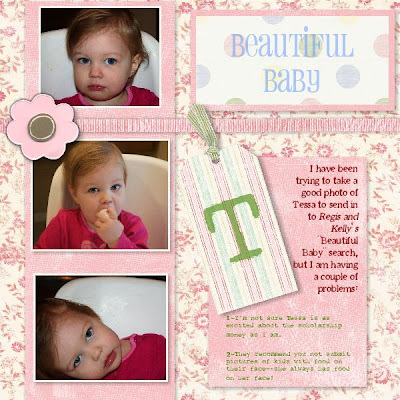 I am a scrapbooker, but have never tried digital scrapbooking. I’ve looked at the Creative Memories starter kit and thought about it. Heck most of our photos are digital anyway LOL. I’ve been wanting to try digital scrapping. I just haven’t done it yet. It’s been a while since I did any paper and scissors scrapbooking, but that’s what I used to do. I have an old-school digital schrapbooking kit that I’ve used for years – Creating Keepsakes. I really like the process, and would love an “upgrade” to a newer product! I have just started to dabble in digital sbing. I am a paper girl at heart! Do you know if this is Mac compatible software? I would like to be entered either way, because I know I can give it as a gift, but I was just curious. Thanks! I have not tried digital scrapbooking as of yet but am very creative and would love to try it. I currently do an online newsletter and would love to do more creative stuff online. I do offline scrapbooking and love to do that so this would be so much fun for me!!! Cool!!!! 🙂 That looks really neato!!!! I have never tried digital scrapbooking. I would love to try though. I am a traditional scrapbooker. I have never tried digital scrapbooking and I would really like to- thanks for the review and chance to win a starter set. I really really wanna try digi scrappin.I love lumpy pages but want to try digi anyway.